You are having a problem configuring Themes for your new computer, which runs Microsoft Windows XP Home. Fast User Switching is enabled to allow your son to use the computer when you are not using it. You notice the interface on your computer looks different than the one on display at the store. What is the cause of the problem? The Themes service is disabled or stopped. 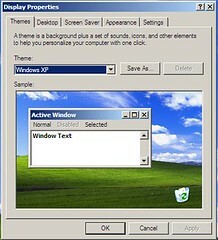 It must be started to support Windows XP Themes.